title="Download the Registration Handbook pdf file." # When team members create their user accounts, they will be able to join an existing iGEM team by request. Once they complete their user account setup, they will have a user account but it will be up to the instructors to accept their membership on the team. Instructors will be able to do this by going to the Team Information page. # The primary contact of the team will be be able to add team members to the team roster by inputting their Users & Groups system user names into the Team Information page. For this, the team members must have already created their own user accounts. This last method of adding team members is probably not the easiest way since you will be faced with a pull down list of all user names, so we would suggest adding members via one of the first two methods. 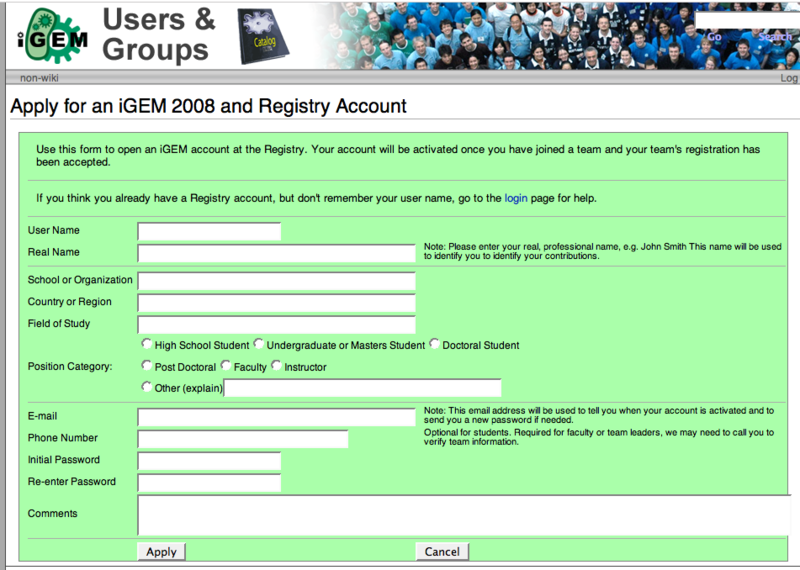 The first step in the entire iGEM registration process is to create a user account for yourself. Everyone must have a user account - instructors, students, graduate students, other faculty, and anyone else on the team. In order to be on a team, you must have a user account. By creating this account, you will be able to access and edit the content on the iGEM 2010 website and wiki, and the Registry website and wiki. You will also be able to use any tools on either of those two websites. It is extremely important that you have a user account! The management system that coordinates all of the user accounts is called the Users & Groups system and it is where you will log in for every website or wiki that makes up the Registry and iGEM. You will only have to log in once at the Users & Groups site in order to have access to the Registry and iGEM sites. Any login link that you see anywhere on igem.org or partsregistry.org will automatically take you to the Users & Groups system. It is a seemless and transparent transition. The most important thing to remember when creating a user account is that we are asking you to provide us TWO names: your real name and your user name. Your user name will only be used to log in to iGEM and the Registry. Your real name will be used for everything else - including keeping track of edits that you make, attributing credit to anything that you have done, and any other presence that you have on iGEM and the Registry. Your user name is simply your login name and your real name is your professional identity. Your user/login name can be anything that you want but your real name must take the form [first name] [last name]. At this time, we can only accept character A-Z and numbers 0-9. We unfortunately cannot accept any special characters yet. We realize that this might pose an inconvenience to some but please be aware that we are working towards having full character support at some point in the near future. When you create an account you will be asked for the school or organization you are affiliated with. This is NOT the name of the iGEM team you are on. This is the school that you attend or the organization that you are with. For example, if Boston College and Cambridge College were to join together to form an iGEM team called Massachusetts, a student at Boston College would write that their school is Boston College, NOT Massachusetts. Once you have created a user account, you automatically have a user page. This user page lives on the Users & Groups system and will never expire. It is not just your profile page for iGEM 2010. As long as you continue using the Registry or coming back to participate in iGEM, you will always have a user account and a user page. When you edit your user page you will be editing it on the Users & Groups system. When you need to change your user information (e.g. if your role in iGEM changes) you can do it on the Users & Groups system. If you ever forget your user name or your password, you can come back to the Users & Groups system. You can look up your user name by searching with your real name. If you forget your password, you can enter your user name and a new password can be emailed to you. In order to participate in iGEM, you must first apply for and then register your team. You must be an instructor to do so - students members will not be allowed to register a team! If you are an instructor, keep reading these instructions. If you are a student, you can continue reading but please be sure to read the section below called iGEM team: registration/roster. There a few things to remember before registering a team. First, and most important, is the team name. In most cases the team name will be the name of the city (or school in some cases) from which you are participating. It must be LESS THAN 20 characters and can only contain letters A-Z. It cannot contain spaces but can contain underscore (_) or hyphen (-). Please do not include the words iGEM, team, or synthetic biology (e.g. the Cambridge Boston iGEM team name should be Cambridge_Boston or the Massachusetts iGEM team should be just Massachusetts). This is your formal team name that will be read by both people and computers so it must be simple and descriptive. Secondly, there are different roles on an iGEM team- instructors, primary contacts, students, and some auxiliary roles. There must be at least two instructors. One of these instructors MUST be a faculty member or staff and the other may be a grad student/post doc if the team wishes. The role of the instructors is primarily an educational one. They are there for support in the following, but of course not limited to, helping with laboratory technique, computational technique, funding, lab space, etc. One of the instructors has to be the primary contact for the team. This person will be the point of contact whom we will get in touch with if we need to speak with someone from the team. They will also be the person who takes care of paying all of the fees associated with being an iGEM team. It is very important that you provide your contact information, both email address, and telephone number. In addition to the instructors/primary contacts there are, of course, the students. The team must be primarily undergraduates or high school students but masters students are also welcome. Graduate students can participate in one of two ways. They can serve as either instructors or in some cases they can serve as students on the team. The student team members must be the ones actually doing the majority of the labwork. Any work not done by iGEM student team members must be clearly attributed to whomever conducted the work and this will be taken into consideration during judging. In addition to team instructors and students, there are some auxiliary roles on an iGEM team. These could be sponsors, part time support from other professors, industry liaisons, etc. Lastly, an iGEM team does not have to have just one school being represented. A team can be comprised of members from one or more schools. In addition, one school can have more than one iGEM team. With the new computational track, it could be that a school has a traditional wetlab iGEM team as well as a computational/software tools team. As indicated above, only instructors can apply for and register an iGEM team. To do so, you should have already obtained a user account on the Users & Groups system. If you have not already done so, please return to the 'create an account page'. Once you have filled in all the necessary information, you can submit your application. Note that this is an application - your information will be sent to iGEM Headquarters (HQ) and we will review it and either accept it or contact you for more details. This is a manual process, not automatic, so it may take a day or two! We will try to be as efficient as possible when it comes to accepting iGEM team applications. As soon as your team application is approved by iGEM HQ, you will be on the list to receive the spring 2009 DNA distribution and you will be able to start to form your team roster. The instructors of the team will receive a team registration code that they can provide to students on the team. The students can then create a user account and at that point, join the already existing team and add themselves to the team roster. To view your team roster, go to the iGEM 2010 Main Page, click on 2010 Teams in the side bar, and then click on your team name.